Sarracenia or North American pitcher plants are hardy wetland plants. Most species of Sarracenia are found in the southeastern states of Georgia, Alabama, Florida, and the Carolinas. However, their distribution extends as far west as Texas and as far north as Canada. Successfully cultivating them requires mimicing the conditions in which they are found in the wild. Sarracenia tend to inhabit permanently wet fens, swamps, and grassy plains. These habitats tend to be acidic with soil made up of sand and Sphagnum moss. Frequently, the soil will be poor in nutrients, often continuously washed clean by moving water. The plants gain their advantage from their ability to extract nutrients from insect prey in this mineral-poor environment. The plants prefer strong, direct sunlight with no shade. Sarracenia need a period of dormancy, or winter rest. During this time, growth is halted and much of the above-ground vegetation dies back. In the spring, growth will resume with the warming of weather and the lengthening of days. If you are growing your plants indoors, rhyzomes can be wrapped in moist sphagnum and placed in bags in the refridgerator for several months to achieve the dormancy period. This can be achieved in two manners. 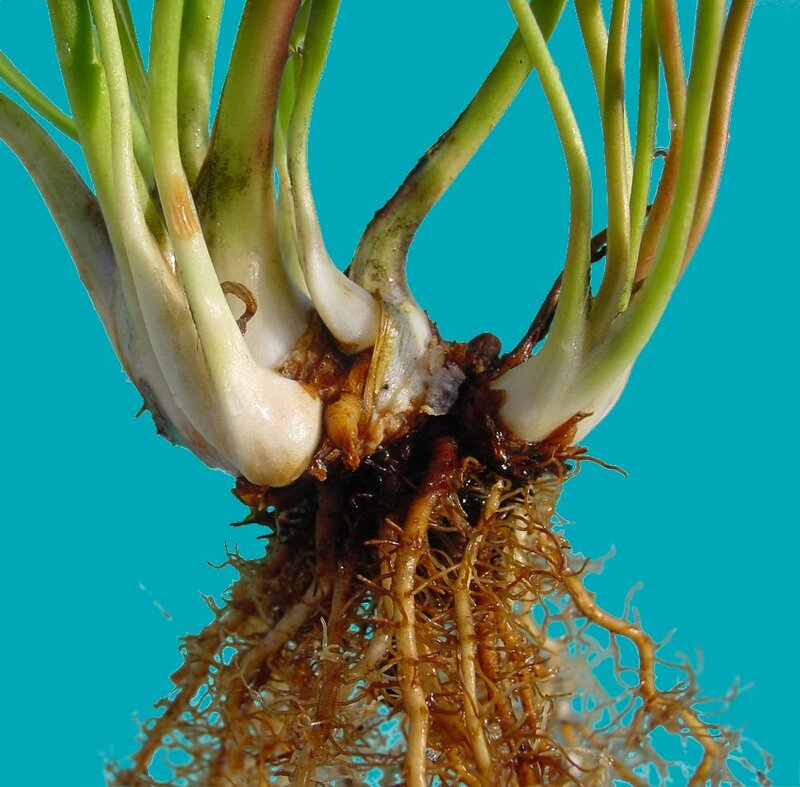 In the spring the rhizome will often form multiple new growth points. These small miniatures of the parent plant will eventually form there own rhizomes and root system and then can be separated from the parent. An easy pull will cause the separation. If you do not separate the plants, they will eventually separate themselves and become a dense clump. Another means of division is to cut the plant rhizome into sections. As you cut, ensure that each segment has its own root system. The cuts should be made with a very sharp knife. Any dead or diseased sections of the rhizome should be removed and discarded. The healthy, rooted sections should be buried in a pot of the proper soil mix. Division should be done in the Spring during new growth. Sarracenia put up large, beautiful flowers in the spring. The flowers are supported on tall, thin stems. The stem bends over and the flower head faces down, giving the flower a nodding appearance. The ovary, anthers, and stigma are concealed between the petals, sepal and style. The flowers are built for proper cross pollination. The bee or other pollinating insect enters the flower by passing over the stigma. It then picks up pollen and exits under the pedal. The bee will repeat this process, pollinating the stigma of a different flower as it enters. After the flower is pollinated, the petals will brown and fall off. The sepal and the umbrella-like style remain. Over Summer the ovary will swell with the production of seed. In Autumn the ovary will brown and split open. The seed can then be collected. A succesfully pollinated flower usually produces several hundred seeds. Propagation can also be accomplished through tissue culture. In cultivation, use a soil substrate consisting of some combination of peat moss, washed sand, and perlite. This substrate should be kept wet during the entire growing season, and moist during the winter dormancy. Use at least 6" pots for mature plants. Almost any ceramic or plastic drained or undrained pot can be used, provided that the soil is kept wet. Stand drained pots in standing water to keep the soil wet. As in their natural habitat, Sarracenia prefer bright light. If the plants are outside, full to mostly sunny is best. If the weather permits, the plants should be outside. Be careful if the sun is very hot and the day dry. Water often in these conditions and make sure the tray has water in it.